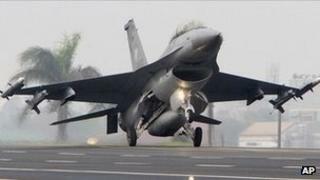 The US says it is delaying the delivery of four F-16 fighter jets to Egypt amid unrest following the army's overthrow of Mohammed Morsi as president. Pentagon spokesman George Little said the decision was made "given the current situation in Egypt". The US is examining whether Mr Morsi's removal was a coup, which would trigger a legal requirement to cut off aid. Earlier, Egypt's army chief called for protests to give the military a mandate to confront "potential terrorism". But Abdel Fattah al-Sisi said he was not calling for public unrest and he urged national reconciliation. In response, the Muslim Brotherhood, which backs Mr Morsi, said Gen Sisi was "calling for civil war". The four F-16 jets are part of an already agreed bigger order of 20 planes, eight of which have already been sent to Egypt. As recently as 11 July US officials suggested the latest four F-16s would still be sent to Egypt. However, on Wednesday the Pentagon confirmed that the delivery was on hold. "Given the current situation in Egypt we do not believe it is appropriate to move forward at this time with the delivery of F-16s," Mr Little told reporters. "We remain committed to the US-Egypt defence relationship as it remains a foundation of our broader strategic partnership with Egypt and serves as a pillar of regional stability," he said. US Defence Secretary Chuck Hagel informed General Sisi of the decision in a phone call earlier on Wednesday, the Pentagon spokesman added. The BBC's Kim Ghattas in Washington says the decision is a way for the US to signal its displeasure with recent events in Egypt without undermining Washington's strong relationship with the Egyptian military. President Barack Obama took the decision late on Tuesday following the recommendation of his national security team, she adds. US military aid to Egypt is estimated to be $1.3bn (£860m) each year. In a speech at a military graduation ceremony broadcast on television, Gen Sisi said: "I urge the people to take to the streets this coming Friday to prove their will and give me, the army and police, a mandate to confront possible violence and terrorism." "So that in case there was a resort to violence and terrorism, the army would have a mandate to confront this." Gen Sisi, who is also the defence minister in the new government, rejected rumours about divisions within the army ranks. "I swear by God that the Egyptian army is united," he said. Media captionMohamed el-Beltagy, Muslim Brotherhood: "Abdel Fattah al-Sisi... is now calling for a civil war himself "
Referring to the army's intervention to remove Mr Morsi at the beginning of July, Gen Sisi said: "I urged the former president to be a president for all Egyptians". The BBC's Quentin Sommerville in Cairo says Gen Sisi's call showed who was really in charge in Egypt - not the interim president picked by the military, Adly Mahmud Mansour, but the military itself. He says it may be a sign of frustration that protests against the interim government are still going on. Senior Brotherhood figure Mohamed el-Beltagy said Gen Sisi was "calling for a civil war... to protect this military coup". "He is proving that he is the actual ruler of the country, and that the president, his vice president and the government do not hold any power," he added. In Cairo, two people were reported to have been killed in clashes at a pro-Morsi demonstration overnight. That followed nine deaths in the city on Tuesday. Mohammed Morsi narrowly won the presidential election in June 2012 to become Egypt's first democratically elected president, but his opponents accused him of trying to impose an Islamist agenda on the country. Following weeks of often violent protests, the Egyptian military removed him from office and installed an interim government.